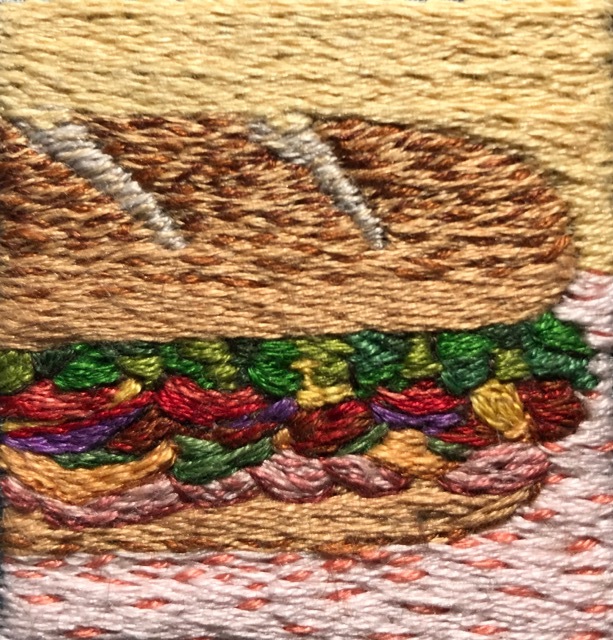 French Knots are one of my favorite embroidery stitches. I love the texture and the many ways they can be used and it is a rare piece that I don't find a way to add them in. 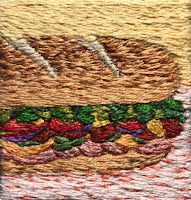 I usually use embroidery floss and French Knots can be made with anywhere from one to all six strands of floss. The number of strands used will help determine how large the knots are. Another factor is how many times the thread is wrapped around the needle. 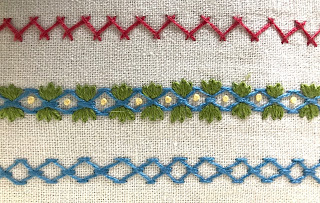 One of the most helpful things I have done is make a grid of French Knots using from 1 to 6 strands of floss and one to four wraps. This little grid is helpful when deciding what size knot I want to fill in an area or create a round counter point. You might consider making one for yourself to keep as a handy reference. I can't tell you how often I use it - but a lot! Here is what it looks like. 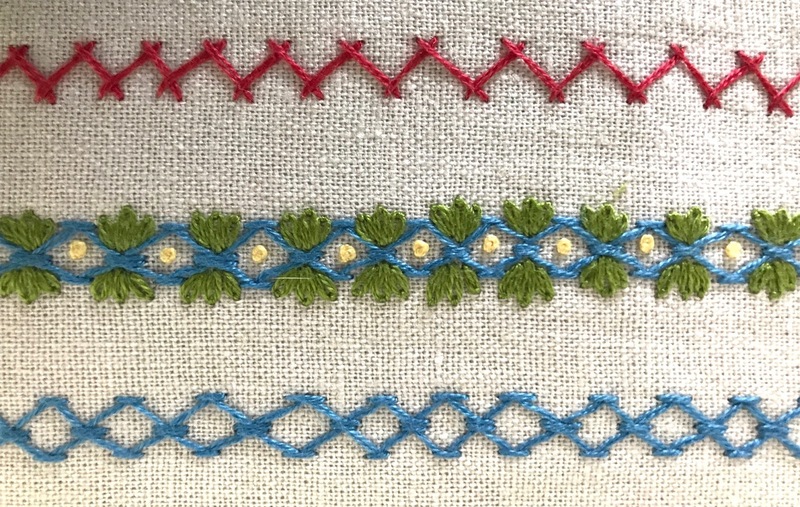 Here are some of my favorite ways to use French Knots. To fill in areas like the sheep and treetops. To fill in for texture in a background or border. To enhance other stitches and create the center of flowers. 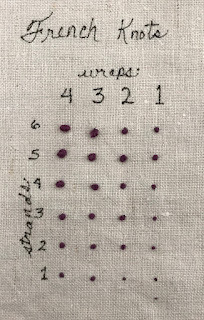 Another example of adding them to a set of stitches. 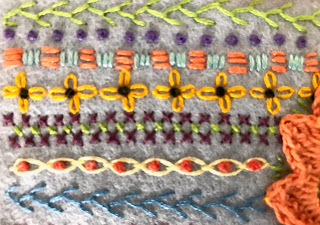 If you have not tried French Knots, they can be a little tricky but here is an excellent video as well as some stitching tips from the fabulous Mary Corbet of needlenthread.com. I thought I'd end with bright pink French Knots exploding out the ends of this flower. Happy knotting! 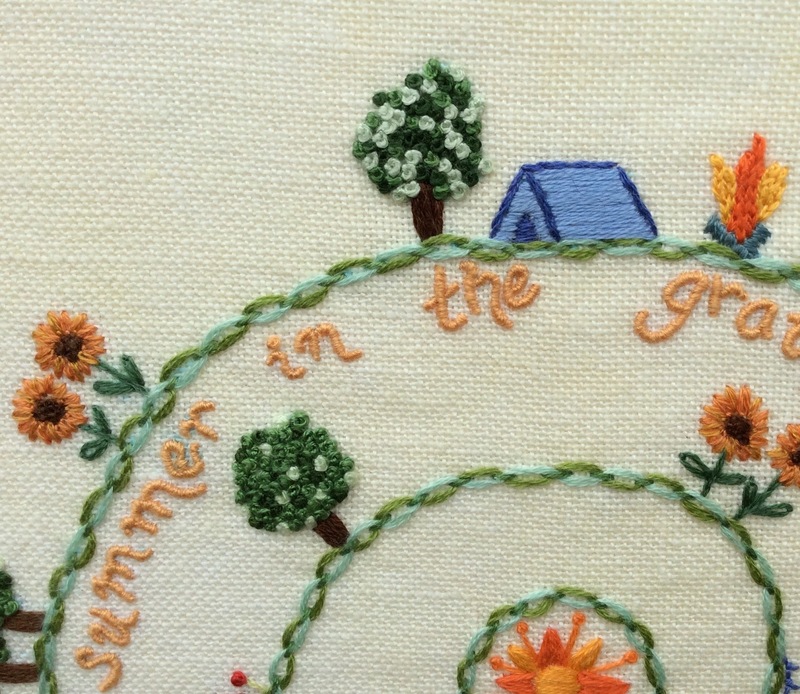 There has been a lot of fun stitching happening around here! I was invited to participate in a collaboration between women chefs/restauranteurs/influencers and women artists and it has been great fun. I was paired up with Golnaz Yamoutpour, the woman behind EatDrinkDishMpls , an Instagram account that focuses on great taste treats in the Minneapolis-St. Paul area. One of the things she told me when we met was her focus on food came about not only because her family had been in the restaurant business but because she thought of food as travel, which she couldn't afford to do at the time. This sparked my imagination because I love to try new cuisines. Flavors can take you both to places you have never been and back to memories of times and places you've experienced. I made 9 images some from the foods and experiences Golnaz told me about, some were my food memories and some were iconic food images. I decided to work in a grid, which is the way images on Instagram are laid out. I knew if I worked large I'd never get done so each image is approximately 1 3/4" square. 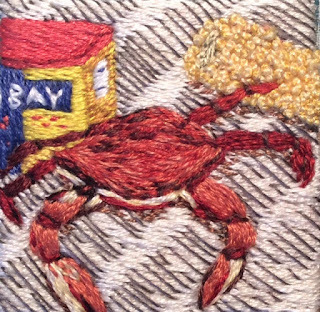 You can see all nine of my embroideries on my Instagram account here. If you are in Minneapolis between March 21 and May 19, 2018 stop by Textile Center of Minnesota and see the work of all 50 artists. Like many artists I have found myself in the past year or so posting more on my Threads of Inspiration Facebook page than on this blog. I am not very happy with that platform for many reasons I won't go into and so, I'm getting back to blogging. I will continue to put links to my blog posts on Facebook so if that is your place to find me, I'll still be there. Now for the updates. Wow! I've had so much going on and so many exciting things coming up! Here are just a few. 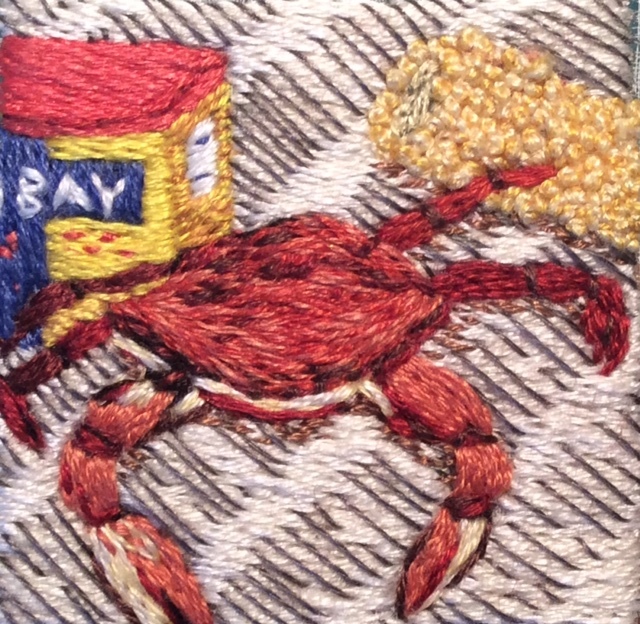 I continue to teach at Textile Center of MN and expand the classes including Wearable Stitches on March 24. We'll add some stitched embellishment to clothing, accessories and even shoes!! 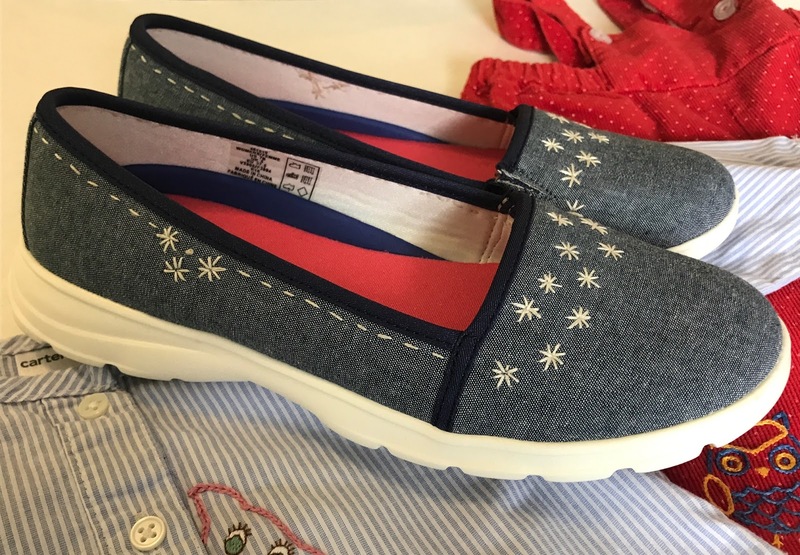 I've got a pair of light weight canvas slip-ons just waiting for some design and color. 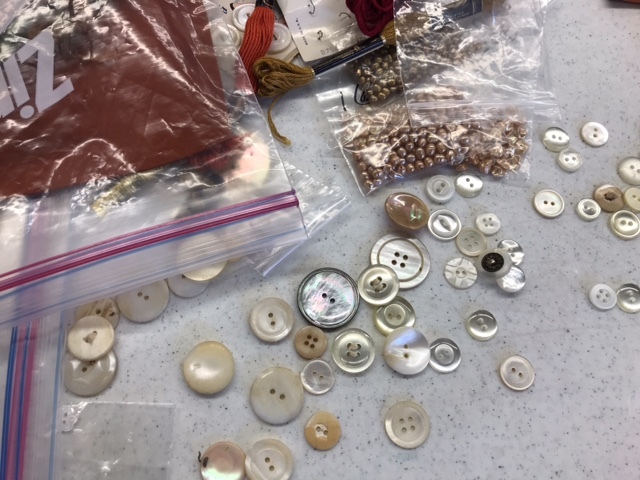 A great new addition to the Textile Center's line up is a series of classes that will be taught over the course of 8 weeks geared to learners over 55. I will be teaching Interlace: Embroidery which I'm really looking forward to. Click on the title to see the full description. It begins on April 25. I'll also be teaching at two great locations, Crossings at Carnegie, an art center in Zumbrota, MN and Shake Rag Alley in Mineral Point, WI. While the Crossings at Carnegie classes aren't listed on the website yet, I'll be teaching Rumi Wisdom on Saturday, April 7 and Quilting Outside the Lines on Saturday May 16. I'll put the links up as soon as they're available. Here is the link for the class at Shake Rag Alley called Beginning Embroidery: Summer Spiral with Rumi Wisdom on July 28. This will be an all day class where I'll be covering some extras - more stitches (YAY) and special focus on various ways to stitch text. I plan on making some updates to my blog including a list all of the classes I'll be teaching on the sidebar so you can always find out where to take a class. If you'd like to have me teach at your guild you'll find a contact section on the sidebar. I hope to meet some of you in person this coming year! 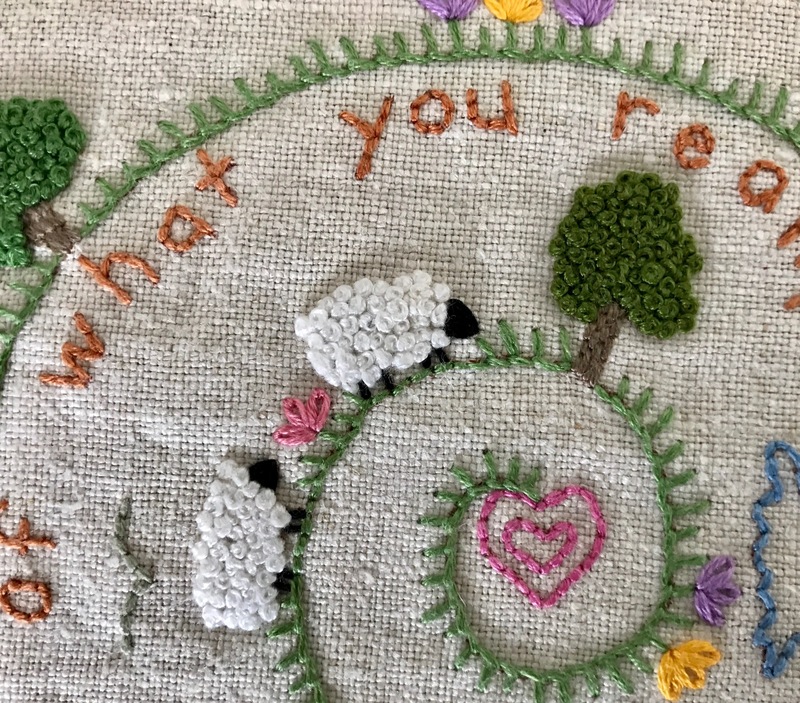 When I taught my first beginning embroidery class a few years ago, one of the first questions I was asked was how to embroider text. It is such a good skill to have so I made sure the design I made for my next class included text. As you can see, it was a spiral with text underneath. I enjoyed the format of the design so much that I have continued designing spirals with interesting quotes. 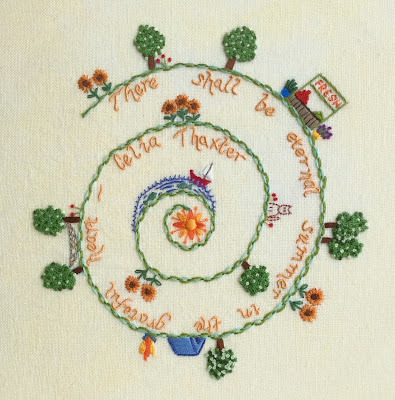 It also has led me to try out different methods of embroidering text. I'll discuss the three I've used, each one giving a little bit different effect and another that is quite common but not on my spiral designs. When I designed Rumi Wisdom I knew I wanted to use back stitch because this was going to be used to teach beginning embroidery stitches. It is an easy enough stitch that covers lines very well and works up pretty quickly. A drawback is the letters end up looking a little blocky. If you want smooth curves, this might not be the best stitch to use. The second spiral design, Emerson Winter, has letters that are a little more stylized with small curves at the ends of some of the letters. I knew that using a back stitch wouldn't give me the look I wanted, so this time I used couching. If you've not done any couching you might find it awkward at first because you have to manage two threads in two needles but after a little practice it is easy. 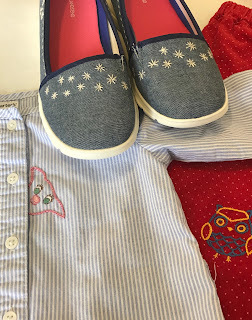 Basically one thread is placed over the line you want it to cover (called the laid stitch) and with the second needle and thread (referred to as the working thread) it is tacked down with tiny stitches. 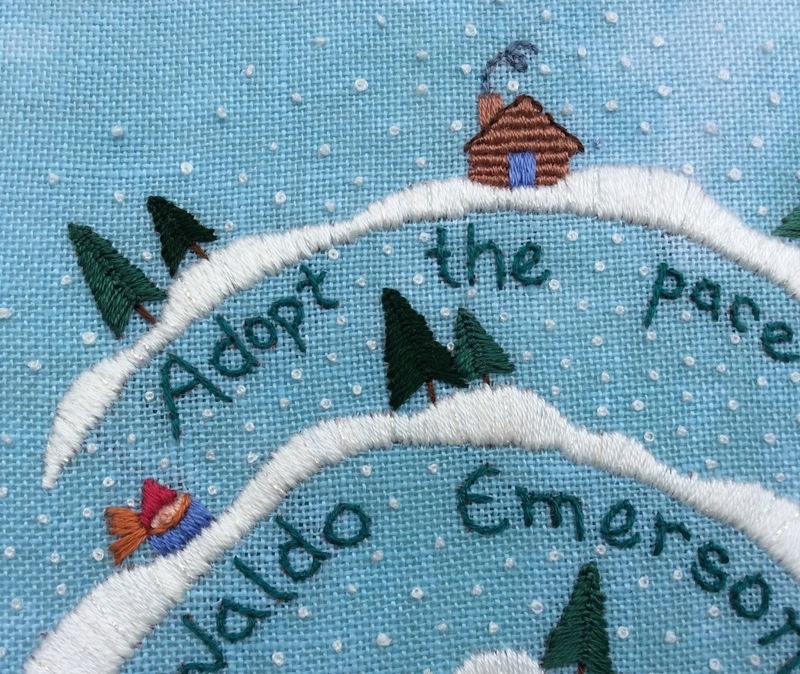 In the case of Emerson Winter I used embroidery floss, but this method allows you to use laid thread that is difficult to stitch with (metallic, thick, fuzzy or loopy threads) because it isn't going in and out of the fabric with every stitch. Couching allows you to get all the loops in the letters you could ever want. The next design I created, Grateful Heart, used a different treatment. These letters also have a lot of loops and serifs but I wanted them to stand out more and so I first stitched them all using stem stitch. If you've stitched many curves with stem stitch you know the thread sometimes has a tendency to fall over on itself and the curves aren't very well defined. To keep the definition of the letters I then stitched a satin stitch over the stem stitch. So, essentially, the stem stitch acts as a padding. Although this is fairly time consuming, it creates a really lovely raised letter and I would do it again in a minute. All of the lettering in these projects is pretty linear but another method of covering letters that have larger areas to be filled is satin stitch. This is often seen on vintage linens that have monograms. to see some fine examples of satin stitch monograms go here. Mary Corbet's Needle n Thread has a fine list of amazing examples. In addition, here are links to Mary's videos that give excellent instructions for creating the stitches that were discussed. 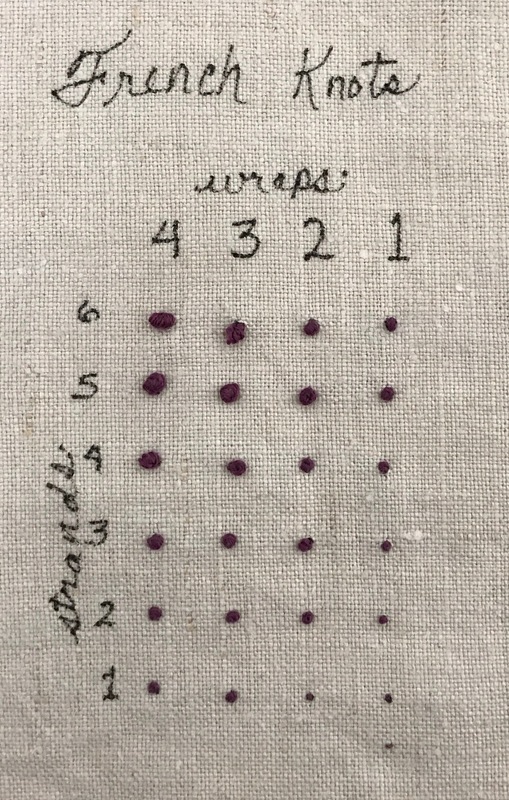 I had mentioned in my previous post that I was going to write about various stitches to use for text. I decided you should probably have a look at my newest design before I get to that. I've been showing bits and pieces of my newest embroidery pattern and of the process creating it here and on my Facebook page which you can find @ThreadsofInspiration. 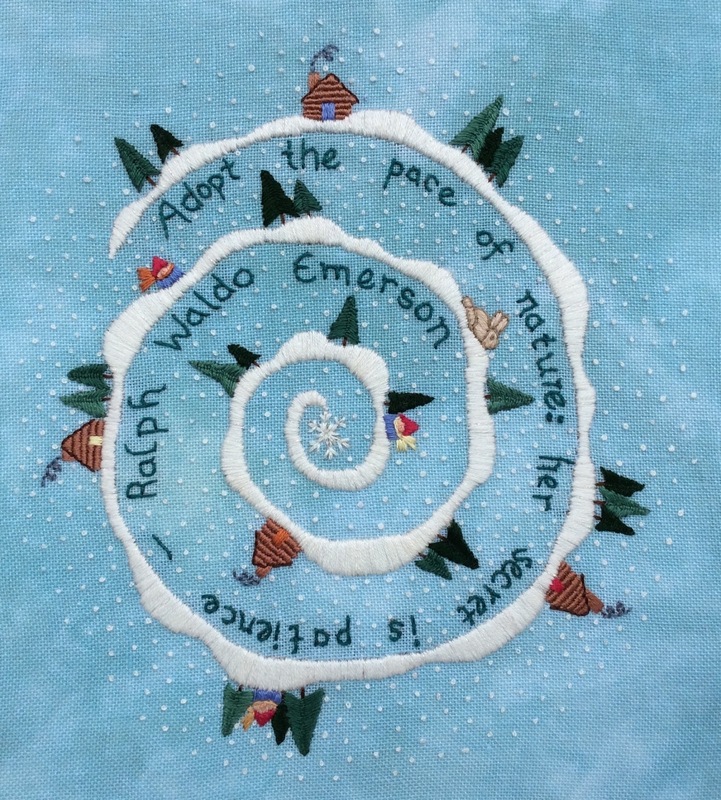 This is the third in a series of designs that uses a spiral and a quote. Each piece is inspired by a season and of course, the quote. 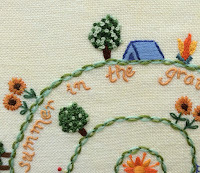 The newest one, Grateful Heart features the words of Celia Thaxter and little summer vignettes - a hammock swinging between two trees, a sailboat on the lake, a small campsite and sunflowers. 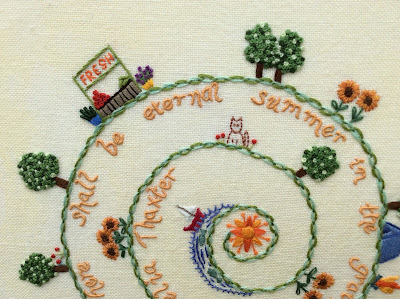 With each piece in this series I have tried a different way to stitch the text and this pieces uses a combination stem stitch and satin stitch. I think it gives the letters, little swirls and serifs great definition. Ever since I added to my stash with things from the Textile Center's Garage Sale I've been busy making. I'm working on a scarf using this Ravelry pattern, French CanCan by Mademoiselle C.
I also finished a skirt using the black and pale pink pique which fits perfectly. I usually have trouble fitting commercial patterns so I used this YouTube video by Felicia Zee and made a pattern from my measurements. I have to say it fits like a dream! I have sewn quite a bit in my life so I didn't have any problem making it. If you haven't sewn a lot you may want to find some instructions for cutting lining and facings and putting in a zipper. All in all I was quite pleased with how it turned out. A funny thing to add is while I was writing this post I couldn't think of the word pique so I googled fabric types and found Sirs Fabric, a site with images and descriptions of different fabrics. I've also finished my newest spiral pattern called Grateful Heart. You can find it in my etsy shop here. I'll have more on that in my next post and some tips on stitching text to achieve the look you are going for. Until then, enjoy your day - the weather here is (finally) stunning so I'm heading out to soak up some sun.